...Great job. We are very impressed with your level of understanding the issue and additional research!" 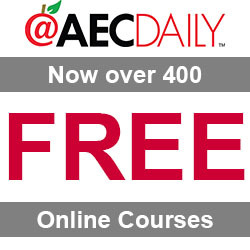 Each year, AEC Daily provides hundreds of thousands of credits to construction professionals. We have more USGBC/GBCI approved courses than our competitors. We get millions of page views every month. Our users spend twice as much time on our site and view double the number of pages than the industry average. We have registered learners in each of the 150 biggest architectural firms in the United States. For more than a decade, AEC Daily has been known for our exceptional commitment to high quality education. That is one of the reasons why we are the only company to have won the American Institute of Architects (AIA) AIA/CES Award for Excellence for Internet Platform Providers. AEC Daily has the respect of the industry, and credibility with learners.